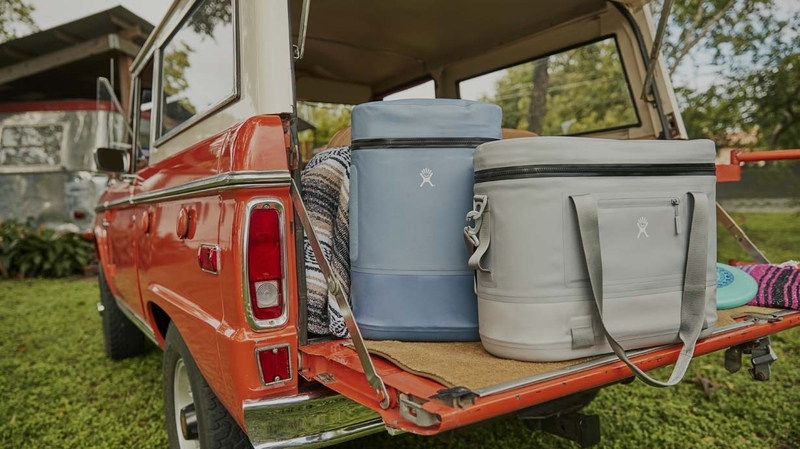 Designed to keep 24 cans—or whatever you're packing—ice cold for up to 48 hours, our new waterproof Unbound Series™ Cooler Tote is designed to tuck over your shoulder and go with you into the campsite or this Saturday's farmer's market. Storage pockets keep dry things dry and side pockets give you a nice place to stash keys or a phone. 24 L Soft Cooler Tote is rated 4.9 out of 5 by 51. Rated 5 out of 5 by JesseL28 from My new go-to This is a great quality sturdy cooler tote. It is quite big so you can fit a lot in it, yet it doesn't look too bulky and I love the sleek rounded shape. I have never had a soft cooler tote before but this one is a go-to for me now! Rated 5 out of 5 by ktex from Excellent Cooler The design and shape of this cooler allows easy access and great insulation. I appreciate that the cooler is lightweight, which makes it so much easier to transport than a hardside cooler. There are also multiple ways to carry the cooler which is very convenient - you can use the padded strap, the smaller straps or side handles to maneuver the cooler in different situations. I also like the small access pouches on both sides of the cooler to store valuables, especially if on the water with friends. Rated 5 out of 5 by EricW from Great cooler but price point is HIGH This cooler delivers everything is promised! Due to the top wide open lid, the contents inside the 24 Liter Tote are easily accessible. In addition, there are 2 external watertight zipper pockets which are great for putting keys or cellphones when carrying. Also, as promised in the attached literature, due to the construction with extra insulating qualities at the bottom of the cooler, it helps keep the contents cold for an extended period of time. My only negative is the price point. For me, the retail price of almost $275 makes this a bit pricey, even given the advantages. If you are able to overcome the price point, this is an excellent cooler and easy to carry a surprising about of food and drinks, especially wine, since it is tall enough to hold several bottles! Rated 5 out of 5 by Andy 12 from Easy to Carry Great size and easy to carry. I am a golf coach for a high school and have been taking a larger hard case cooler to all of our matches for years. This cooler is so much easier to handle and takes up lest space in the van. Yet is still carries a ton of water and Gatorade. It also keeps ice much longer than the older cooler. Rated 5 out of 5 by hmezz from Great color and great features I purchased this cooler earlier this summer and it has been a super dependable way to carry and keep food chilled. Rated 5 out of 5 by Anonymous2 from Awesome cooler! Will be perfect in summer!! Love this cooler and can't wait to take it out on the wakeboard boat this summer! Doesn't take up space like a hard cooler but fits all my snacks and refreshments easily. Been using it for trips to the grovery store too to keep things cold if I am not headed home right away. The best! Rated 5 out of 5 by Stellatekla from Love this little guy!!! I bought this for my husband but I have been using it! It a great color(goldenrod!) love the strap and zippers!!! Rated 5 out of 5 by Steve09 from Wonderful cooler The cooler is so spacious, great material, strong zipper, and keeps things cold forever. Rated 5 out of 5 by RJC21 from Great cooler! I bought a tote for myself and liked it so much that I bought a second as a gift for some friends. By far the best cooler I’ve owned. Rated 5 out of 5 by Cng002 from Perfect for On the Go Bought this cooler to keep up with all the activities for the kids. Saves us from always stopping at convenience stores. Fits perfectly between seats. Rated 5 out of 5 by Ramonasun from Amazing product When I received my bag I ran a test of filling the bag up with ice and leaving it sitting in the California sun and the amazingly the ice lasted two full days and there was still some ice that did not melt yet. I brought this cooler bag because i wanted to keep food cold and not run the risk of food spoiling when out and about and getting my family sick. Now I have no worries of my food getting bad because this hydro flask soft tote keeps everything cold for more than 48 hours. Rated 5 out of 5 by Kimberly1234 from Awesome for Roadtrips! This cooler rocks, really durable and keeps things COLD! Rated 5 out of 5 by Chrissyymakeup from Absolutely love! I absolutely LOVE this tote! I have it in a gold which I think is super cute. When it arrived, it was a lot larger than I expected. I plan on utilizing this when I going boating in the spring/summer months. Rated 5 out of 5 by Shawnam79 from Stylish and functional I love this cooler. It’s huge and very stylish it’s made out of really high quality materials. It has 2 zippered compartments one on the front and one on the back for extra things. The bottom portion feels like rubber. I can’t wait for it to warm up so I can use this on some of my trips. Rated 5 out of 5 by dionaea from Vertical design = small footprint, big interior The stunning golden color is easy on the eyes while attracting complements no matter where I take this cooler. It combines usefulness with elegance very well. We took it on a 2-day trip in a 9-seat SUV to visit area art museums this past weekend with fellow local artists, and the vertical design was easy to fit in the aisle between seats and to carry in and out of our hotel without any sacrifice of interior space. The padded handles and shoulder strap give you a choice for the most comfortable carry option. Wine bottles and 2L soda bottles stand upright, which is better for stable placement, retrieval and return of ice packs and food items in the cooler. The zippered pocket on each side can hold essential paperwork like passports, ID, money, etc., or a few napkins and eating/serving utensils. With a stiff base that extends up the sides, the cooler stays upright wherever you set it down without tipping or leaning. A spill from an inadequately closed container of BBQ ribs wiped up quickly and cleanly without a trace of stain. A few small dirt marks on the exterior were just as easy to remove completely. Everything we put in the cooler stayed at a safe cold temperature, with the ice packs just beginning to thaw on our return journey. The exterior stayed dry and the interior stayed cold regardless of temperature changes in the outside air. The craftsmanship in this cooler is top of the line and evident from the moment you hold it in your hands. We are planning several trips over the next several years, both local and long-distance, and this Hydro-Flask Unbound Cooler Tote is definitely going with us. Rated 5 out of 5 by HollaRobRob from Best Cooler This is by far the most convenient cooler I've ever used. I have no issue/s transporting the cooler from my home, to my car and onto my destination. Most coolers I have used are large, bulky and heavy from several bags of ice. I use ice packs in the cooler instead of ice. The Hydro Flask 24L Soft Cooler Tote is lightweight and roomy. I can carry the flask easily by the handles and straps and my belongings stay cold, even when the cooler is placed in direct sunlight! Rated 5 out of 5 by Bretskii from I’m in love with my cooler tote. I got this tote to use at the lake, hoping that I could keep my drinks and snacks cold at the pool and on the boat. So far, this tote is blowing away my expectations. It is so sturdy, high quality, spacious inside, and super nice zippers. I can fit half my fridge in this thing and it still doesn’t feel heavy on my shoulder. Best part is that the ice is still frozen at the end of the day. Rated 5 out of 5 by wcat84 from Awesome cooler I bought this cooler tote a little over 2 weeks ago. I used it on a girl's weekend for our lake trip. It was perfect for storing food, groceries and drinks that I was taking. All of the girls on the trip asked about it and said they wanted one. It also did not leak as others have when I put food on ice. Will this keep ice cream frozen? Does it require separate ice, or are there inserts in it to freeze? It requires ice or an ice pack. We do not provide an ice pack with the cooler. Eh, kind of! They are a soft cooler, but the insulation provides some degree of rigidity. It would take a good amount of weight to keep it folded. Where are the soft cooler totes made at? The Soft Cooler Tote and the Soft Cooler Pack both hold 24 cans. I just bought a hydro flask cooler bag. How long is it meant to hold ice, I have used it twice now and each time within 6 hours the ice is completely melted. Is there something I should know to keep the ice longer? I&rsquo;m looking for a case that also will hold several hydro flask bottles (32oz). Will this do the trick? what are the actual thicknesses of the foam used in the cooler (top,bottom,sides) and what type of foam is used (close cell, open cell other)?